So, after a few teething problems (an airlocked panel- slight modification to include air bleed valve, and a pin-leak in one joint) The panels are heating our water! Thought I would share the cost of the system too so people can decide if it’s worth it or not…. Excluding the roof itself (i.e the structure and polycarbonate roof sheets), the aluminium (reclaimed from our old mobile home), the other bits and bobs like gas/solder/flux… the plumbing bits cost a total of £170. Quite a lot of time has gone into the fabrication and installation, and we already had the twin coil cylinder installed so this perhaps is not a true reflection of a retrofit system, but my feeling is that it will VERY QUICKLY repay the investment. There is a point also I should make about this type of installation- it will not pass muster with building regs and SAP reports as it does not have HETAS approval or efficiency ratings, and is not installed by a qualified engineer- so clearly it’s not worth doing….? A rant for another day methinks! Anyhow, hope you have found this interesting. Solar heating- re-using our mobile home! Hello and welcome to the newsletter once again. As always things have been ticking along and lots of things happening here- not least because of our current (and long term….) volunteer Tim, who is young fit and enthusiastic, and has helped move us swiftly through a long list of tasks to the point where we actually feel like we might be ‘on top’ of things for a while. Amongst these projects has been the Solar Water Heating panels. Initially my thoughts were to purchase aluminium clip on solar fins from the Centre for Alternative Technology (CAT)- these I have used before in the several systems I have built. On looking however I found they were no longer for sale. We eventually settled on a plan- since we had recovered the aluminium sheeting from the outer of our mobile home we would manufacture our own clip fins…..
After a few trial goes, we settled on a jig that worked, and wearing ear defenders proceeded to hammer out the slots in the cut rectangles of aluminium sheeting. We used a 15mm steel bar (from a well known on line auction site….) and the jig from scraps of wood and angle steel. We used a Header/Footer and riser layout for the pipework- 22mm for the main Head/Foot and from panels to the cylinder, 15mm for the risers which the fins clip to…. After soldering each of the four panels up, we installed the fins using silicone to fill the small gap between fin and pipe (silicone conducts heat better than air…). A slap on of matt black paint, and we moved to the installation. 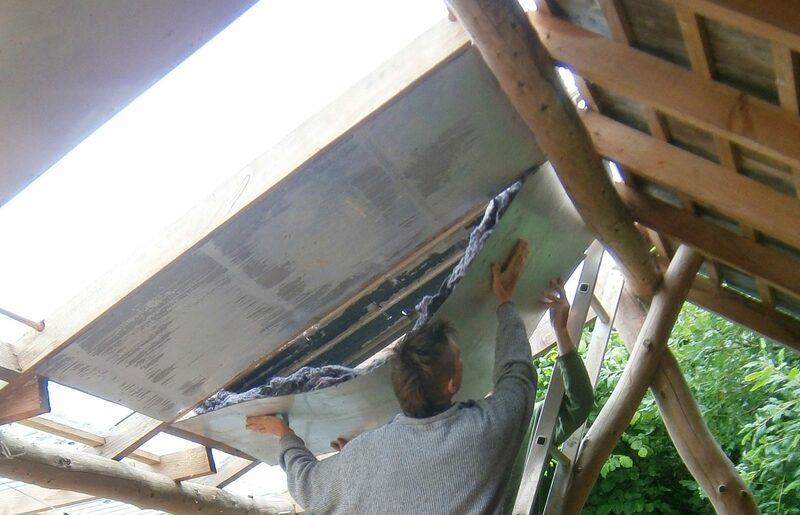 As those who have read earlier posts on the house blog site may recall, the outdoor kitchen roof pitch was set to get the best average summer sun, and our intention was to mount the panels into the rafters of the roof. This inevitably meant removing the polycarbonate roofing sheets, and drilling holes in perfectly good rafters…. a window of good weather was needed and we were lucky it happened just as we were ready to install. Tim installing the backing to a panel. More soldering, lots of awkward ladder positions and messing about balancing on narrow bits of wood, and we had the panels in place. We backed them with more aluminium sheeting and insulated with the remains of our old futon mattress… hoarding things that ‘might be useful one day’ sometimes pays off! The pipework to the cylinder was the next challenge- hindsight is a wonderful thing and it showed me that I should have left myself better access to the hot water cylinder- I had to cut a hole in the wall between Elowens’ room and the airing cupboard- messy and awkward, and has left me another thing to tidy up. Ah well! Drilling through straw walls is interesting! Without further minutae of detail suffice to say I managed to plumb the system in and solve the few small leaks in solder joints. The indications thus far are that all will work fine- but we have not had a good hot day to properly show this to be the case….. I will keep you updated. As with any of these posts if you would like further information or to chat about stuff we have done get in touch. Click on the subscribe button in the menu above.